This handsome Bar Mitzvah invitation on Navy Matte Shimmer card stock features a modern Star of David to the left of your wording details. 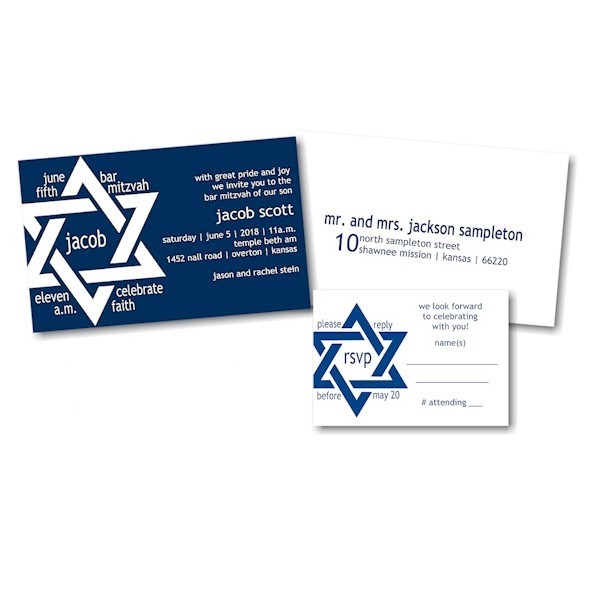 This handsome Bar Mitzvah invitation on Navy Matte Shimmer card stock features a modern Star of David to the left of your wording details. Your first name will appear within the star. Measures 7″ wide by 5″ high. Shown with flat White ink and lettering styles MS Trebuchet. The coordinating Reception and Response enclosures will print on White Matte single card stock and the Thank You notes will print on White Matte folding stock. This Bar Mitzvah invitation is accompanied by single White Matte envelopes.